1 What are you talking about? 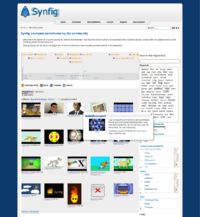 Every month the Synfig community organizes a fun challenge where people can show their talent, skills and humor using their favorite design tool: Synfig. All this great action takes place in the Synfig Forums. You can also participate and show all of us how good you are. There are some rules for participation that you should follow. This page was last modified on 2 January 2015, at 07:40.